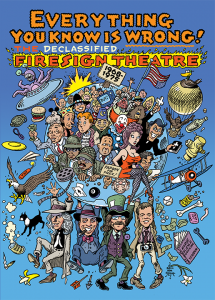 Legendary comedy group The Firesign Theatre presents a new double-DVD compilation, EVERYTHING YOU KNOW IS WRONG: THE DECLASSIFIED FIRESIGN THEATRE, 1968-1975. The collection is a survey of the group’s television and film work from their classic Columbia Records era, with over seven hours of material gathered on two discs. Included are Firesign’s 1974 short feature Everything You Know Is Wrong; their 1972 concert film Martian Space Party; Questions and Answers Live at UCSC, a televised stage show from 1975; About a Week, a filmed performance and interview for Los Angeles TV in 1971; the complete series of Jack Poet Volkswagen ads, which Firesign wrote and performed for television in 1969; more than three hours of home movies; photo galleries; and more. Everything You Know Is Wrong and Martian Space Party both feature running commentaries recorded by the full group in 2009. All of the material in the package has been unavailable for over 20 years, and most of it has never been released in any form. ← Previous Previous post: The Naked Cosmos – Back in Print! Do you actually have copies of the new double Firesign Theatre DVD Everything You Know Is Wrong in stock now? Is it actually out yet?!…thanks! Yikes! Why did we not see this comment until so late? But of course the disc is here, which is why the page went up at all.